A bit of a side-bar rant. The brand name “Saturated Fat” might be a lost cause. The world largely considers it bad thing and making it seem good again might be a waste of resources. These are all individual acids that have distinct names and effects on our overall health. Let’s start touting the acids instead, a re-brand of sorts. If people can know, praise and pronounce “garcinia cambogia” surely they can remember lauric, stearic, butyric and palmitic, etc…. While doing some research I stumbled upon some interesting charts in the “Encyclopedia of Human Nutrition, Four-Volume Set” on Google Books. 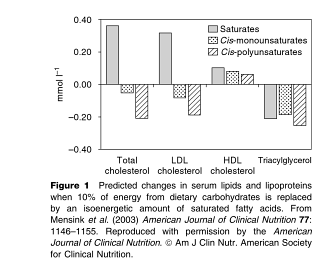 The charts show the effect that Saturated Fat Has on Blood Lipids when replacing 10% of carbs in diet. The first chart also examines the effects of monounsaturated and polyunsaturated fats. 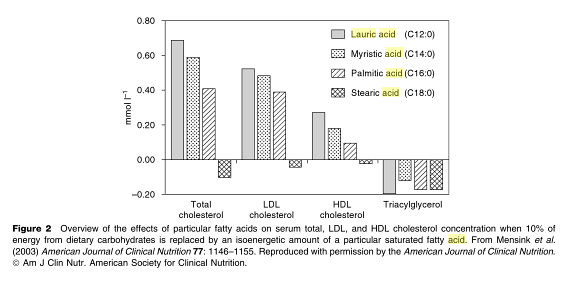 The second chart shows the different effects of various Saturated Fatty Acids (SFAs). Chart 1 – Effect of the various fatty acids (sat/mono/poly) s on blood lipids. So, what about the LDL going up in the SFA group, cause for concern? Shouldn’t be as more research suggests LDL is not quite the risk factor for CVD that it was once thought to be. It seems to have little impact on mortality and is nuanced as LDL itself has different particle sizes. Without oxidation of LDL, there would probably be no plaque buildup. Additionally, high HDL-C will act as a “shuttle” to transport LDL from blood; I think of it as a street-sweeper. The following Primal Docs post by Posts by Axel F. Sigurdsson, MD has an interesting article about “10 Pitfalls of Using LDL Cholesterol to Assess Risk“.